Any and all information you provide to us will be held confidential and will not be discussed with anyone without your permission. We will be happy to provide you with a copy of our confidentiality agreement or to execute one that you have. With or without a confidentiality agreement, we consider all information and recipes you provide to be yours. We reserve the right to seek the guidance or assistance from the appropriate regulatory officials and your production staff or co-packer to complete the analysis of your product. We prepare a computerized nutritional analysis of your product using your standardized recipe and a data base of 45,000+ ingredients. PLEASE NOTE that the standardized database lists ingredients in a format that may be different from how you would list the ingredient. Sometimes the listing can be changed, in other cases it must remain as is. Label(s) as a PDF for your review. Based upon your review we will make any desired and allowable changes to the label such as ingredients, format, portion size, etc. Where appropriate and/or requested we provide consulting related to standardizing recipes and altering recipes to make a more consistent, healthy, or salable product. These services are charged for separately from the nutritional analysis and label generation. We will provide you with the nutritional analysis and allergen statement. It will be up to you (and your graphic designer) to ensure that your label meets all applicable state and federal labeling standards. We recommend that you have a proof of your final label approved by the appropriate state and fereral authorities. We can help you find a graphic designer to design your logo and your product label or are happy to work with your designer. We do not currently have an in-house graphic designer. 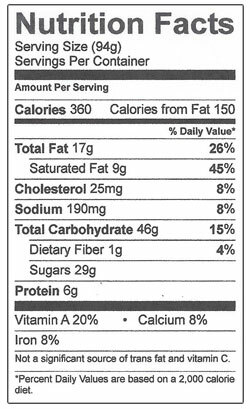 Advice and consulting on label design is not included in the nutritional analysis. We need a standardized recipe that lists all ingredients and amounts used as well as the recipe yield and portion and container size. Where specific brands are used in the recipe, we will need to know the brand and it is generally a good idea to provide us with a copy of the nutritional label from that product in case it is not already in the database. In general, the more information you can give us, the smoother and faster the process. We also need to know whether you want the label to be place horizontally or vertically and whether you want the full or simplified version (see our website for examples). Day 1 –We receive the recipe and quickly review it to see if it seems clear and complete. If we need any additional information from you, we contact you by email or phone. Day 3 – We email you a draft of the nutritional label with any questions we have. Day 5 – We make any changes or corrections you want or revise the label to account for more accurate information provided by you. We email you another draft of the label. If you approve this second draft, you can start using it either by printing it yourself or forwarding the file to a printer or graphic designer. We are generally out of the office on Mondays and Thursdays, so please do not include these dates when calculating our response time. We had a situation where a client rushed the process, providing us with incomplete or inaccurate information and changed their mind on what they wanted included on the label because they were in a hurry to get into production. This created stress and dissatisfaction on their part and ours. We strongly suggest that you allow sufficient time to provide information and perhaps additional information, as well as to review the draft label. We suggest that you allow at least two weeks for this process, plus the time for your graphic designer or printer to receive the information and produce your labels. The initial review of ingredients and communication to you about missing information. The first draft of the label. The second draft of the label. If additional label drafts are needed there is no charge if we were at fault. If additional drafts are necessary because of information that you failed to supply or because you want changes made, for whatever reason, there will be a $35.00 charge for each new draft. Where you have similar recipes that require different labels, each label prepared for the similar recipes will be charged at a rate of $35.00 per label. Recipes are considered different enough to warrant the full $100.00 charge when 20% or more of the ingredients (by number) are different or have different amounts. Where foods are packaged in different sized containers there is a $10.00 charge for preparing the labels for each different package size. INGREDIENTS: Flour, all purpose, unbleached, Baking Chips, white chocolate, Whole Milk, Butter, unsalted, Sugar, Egg, white, Light Brown Sugar, English Walnuts, Baking Soda, Flavor, vanilla extract, Baking Powder, Salt. Ingredients: Unbleached Flour (Wheat), White Chocolate, Sugar, Milk, Butter (Milk), Egg, Walnuts, Baking Soda, Vanilla Extract, Baking Powder, Salt. Ingredients:d Unbleached Flour, White Chocolate, Sugar, Milk, Butter, Egg, Walnuts, Baking Soda, Vanilla Extract, Baking Powder, Salt. Contains: Egg, Milk, Nuts, Wheat. 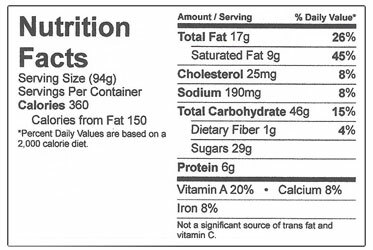 When we have completed your label we email you the Nutritional label as a PDF file that can be altered, so that you have the ability to edit and finalize your Ingredients List and Contains Statement as you choose.